Like many wartime pilots, Lt. j.g. George H.W. Bush named his airplane after a girl back home. But he had to call it “Barbara III,” since he lost his first two planes — one during training and one to enemy fire. That’s how dangerous flying was in World War II. There were 16 pilots in George H.W. Bush’s squadron, according to retired Adm. Samuel Cox, director of Naval History and Heritage Command. “Half of them were killed or captured before the end of the war,” Cox said. 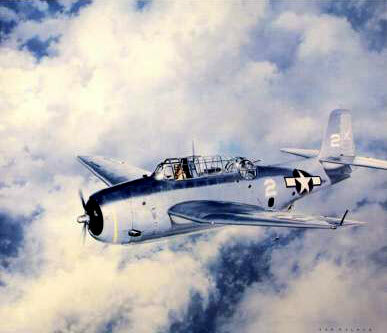 He flew the TBM “Avenger”, a carrier based torpedo/ bomber which had a three-man crew. His target on Sept. 2, 1944, was a Japanese radio transmitter on the island of Chichi Jima. His plane was hit as he began his run into the target but he stayed with it until he dropped his bombs. Out over the water, Mr. Bush told his crew to bail out. George H. W. Bush was one of eight VFW members who have become U.S. Preseidents. At our November meeting, the Post charter was draped to honor the memory of Warren Eddy. Warren, who was a long standing member of Post #8870, served in the Army during WW II. Warren was raised in northern Minnesota and joined the Washington State National Guard unit upon moving to the Pacific Northwest in 1940. Soon after the unit was activated, Warren was selected to attend Officer Candidate School. After receiving his commission in 1942, he was assigned to a weapons battalion after which he boarded a ship headed for England. His battalion boarded LST’s on D-Day, and for the next three days, Warren and his men remained on the landing craft. Finally, on the morning of D-Day +4, they dry landed on Normandy Beach and headed inland. While his unit’s mission was air defense, they were used primarily to provide ground support to the infantry. His battalion was assigned to the 29th Infantry Division. Shortly after arriving in France, Warren was ordered to reconnoiter a road to locate the enemy and assess its strength when the three soldiers were ambushed. For his action in returning his men to safety after being ambushed, Warren received a Bronze Star with a “V” device for Valor. Warren participated in combat operations as the Allied Forces chased the Germans back to Germany. Upon his return home, Warren joined the Army Reserves and retired at the rank of Major. He and his wife, Sandra, were married for over 50 years, and they had two children, six grandchildren, and two great-grandchildren. Warren, who died after a brief illness, was a Life Member of VFW. The Post has 211 members. Included in that number are 153 Life Members and 58 Continuous Members meaning every year we need to have 58 souls send us checks for their dues to arrive at 100%. Herding cats is a slightly easier task. To complicate matters, anyone joining after January 1, 2014 has a membership based on the payment date and anyone who was a member prior to that date has a membership that expires on July 1st (this would be the bulk of our 58 members). This new system is great for National’s cash flow and murder at the individual Post level. So if you are a continuous member, please pay ASAP so our Quartermaster doesn’t go insane trying to run after everyone. Better yet, simply become a Life Member. Don’t worry that by paying a bit early you will be forfeiting part of your prior year dues. National simply extends the expiration date of your membership by 12 months so you get the benefit of a full 12 months anytime you make a payment. Alternatively, you can go online to VFW.org and renew your membership there. Either way, the sooner the better.